A big, round, pink-igloo fort that my kids made out of umbrellas. and friends and neighbors even stopped by. I’m learning that the house doesn’t always have to be matchy-matchy and perfect. In fact, it’s a whole lot more fun when you have a pink igloo in the front room. It makes for some good conversation. 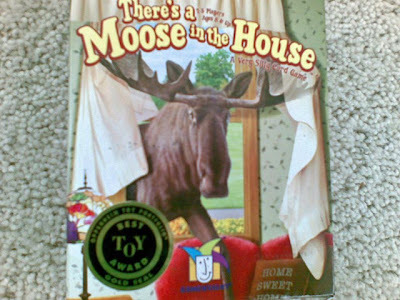 But, back to the moose. There is one in our house. And we’ve been playing it a lot lately. Because with this whole “One Month” thing, I’ve been trying to create more fun moments. Moments like swimming in our socks and sitting in massage chairs. The other day, my son and I fenced with Star Wars light sabers until we were sweaty. I learned some pretty smooth moves and ended up getting a good workout, too. And remember when I told you my daughter stood up through the sunroof of our car when we were parked in the parking lot? Well, I’m proud to say I’ve officially let loose. A couple of weeks ago, I drove home from the mailbox at the end of our court with her standing through the sunroof. Drove. With the car moving. You should’ve seen the smile on her face. As I rode the exercise bike, instead of burying my head in a book like I usually do, I decided I’d smile and say hi to every person who turned the corner. It was fun to see the look of surprise on so many faces, and to get so many smiles back. And through all of this, I’m learning more and more that having fun each day—having fun in life for that matter—is so much about just making it happen. I love this. Sometimes I think I am wound way too tight. I want to ride down the street with the sunroof down, standing up and embracing the wind. Now, I just need to find a convertible!